My husband and I both have bikes and were looking for an easy way to store them on our back porch. My husband found this one and we have been happy with it. 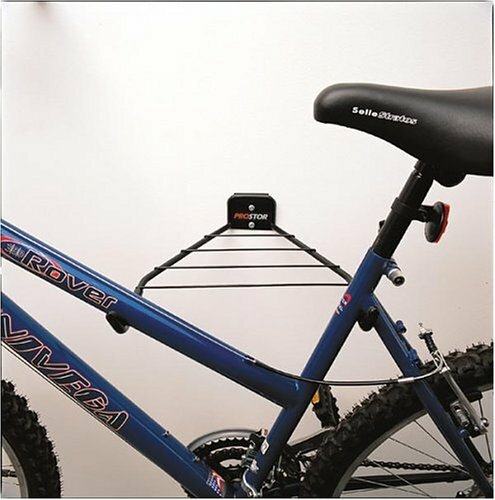 The bikes are easy to get on and off, and the rack keeps the bike up off the porch. Only down side is the protective coating cracked and fell off within a few days. I don't think this hurts the bikes; I just didn't know why it wasn't made stronger. 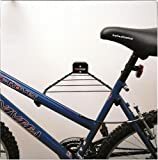 This is a very simple product, just a metal rack to support your bike so there's nothing cutting edge about it. However, the finish is nice and it does fold in easily as stated. The fold-up is nice since you wont inadvertently wack your head against it when unloaded. My road bike is only 20 pounds so not that heavy, though I don't see issues if you put something very heavy as long as you are screwing into something solid such as a structural piece of wood rather than decorative boarding. Overall I'm satisfied as the price was right. Would buy again. To be honest I had my doubts this would hold up 2 mountain bikes (although both aluminum) but it is quite sturdy. The third time putting the bikes on the rack though, the rubber coating ripped off of one of the supports, I'm going to have to wrap tape around it to keep it from coming all the way off. I'm sure I should have lifted the bike higher instead of just pulling the bike off and it may not have happened. Also be sure to pre-drill for the mounting screws as they are fatties. I stripped one pretty good trying to skip that step.